With the bitterly cold weather that has been battering us here in the UK lately, I do think the ONLY thing I am going to miss about the end of the winter season is Blood Oranges. So in light of this, I recently went on a blood-orange-freezer-stocking-frenzy. Alongside batch cooking some blood orange chia jam (like a super fancy version of marmalade), I made this gorgeous cake. Knowing that it will sit prettily in my freezer ready to wow at a last minute dinner party makes me feel a) pretty smug and b) totally, utterly 100% ready for Spring to arrive now! I used to look at cakes like this on Instagram with terror. I always put them in the ‘too hard to try’ category. But once I’d tackled my first one, I realised I needn’t have worried at all. They are only as difficult as blitzing two separate layers in a blender and popping them in the freezer. I find them much easier than baking a cake in the oven with no risk of either a gooey middle or it being too dry. I also love desserts that can be done in advance, that just sit there in the freezer patiently waiting to be lovingly devoured. This beauty is vegan, gluten-free and only naturally sweetened with dates and bananas (see my previous blog post which is all about different types of sugars and what they do to our bodies). The addition of Matcha not only adds a lovely green colour to the cake, but a ton of antioxidants called polyphenols which are showing some very promising results in cancer prevention studies. If you can pack in some positive nutrition whilst enjoying a decadent dessert then why the heck not, eh?! Plus, this way we get to enjoy the joys of blood oranges long after their short season is over. · Quick soak both the almonds for the crust and the cashews for the filling in separate bowls of warm for 30 minutes (or ideally in the fridge overnight but I rarely remember in time) while you gather the rest of the ingredients. · Add all of the ingredients for the crust into a high-speed blender, and blitz until the consistency is a fine crumb, yet sticks together when you press it between your fingers. · Grease the bottom of a spring-form cake tin with coconut oil and spoon out all of the base mixture into it. · Press down firmly with your hands so that the base reaches all the sides on the tin, and is of an even thickness. · Pop this in the freezer while you make the filling. · Drain the cashews, and put them into a high-speed blender along with the dates, salt, bananas and vanilla. · Blitz together until completely smooth. 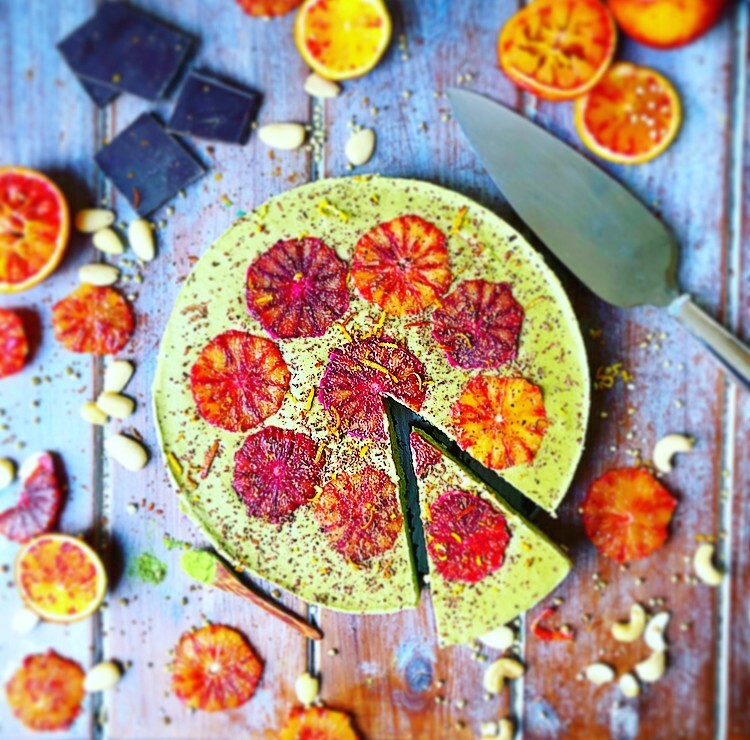 · Add the melted coconut oil, matcha powder, orange zest and orange juice and blitz again. · Pour this filling on top of the crust. · Smooth with a spatula and put back in the freezer to firm up while you prepare the oranges for the topping. · Peel and slice the blood oranges, making sure there is no pulp left on the edges. · Arrange the orange slices nicely on top of the cake and press them down ever so gently. · Cover with cling film and freeze for several hours (or days or weeks!). · When you are ready to serve, remove from the freezer 20 minutes before you want to slice it. · Shave the dark chocolate on top and slice with a warmed knife to make cutting it easier.